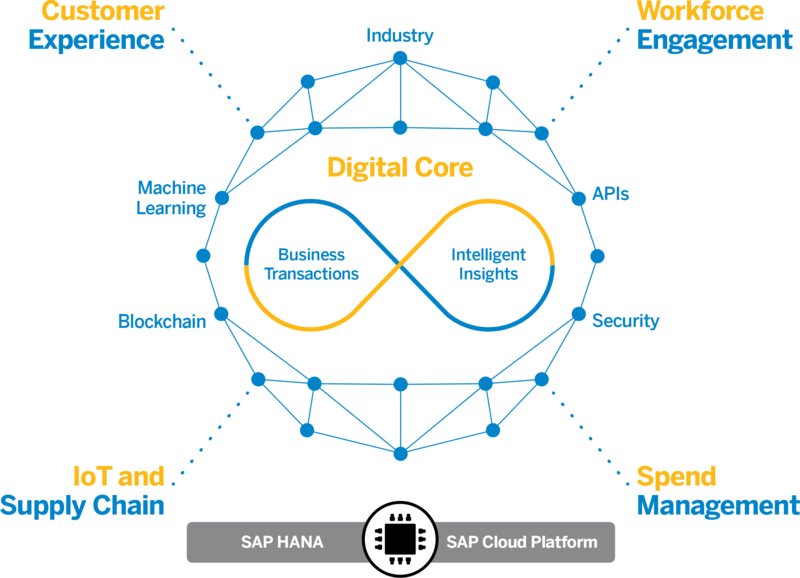 Encross has capabilities across the full landscape of SAP Business Suite & S/4 HANA solutions: Strategy, Architecture, Implementation and Support. Our core competency is delivering SAP expertise to address the need for highly competent functional, technical and project management skills that make up the core leadership of successful SAP project teams and support organizations. New Implementation — In this scenario, the SAP S/4HANA system is implemented, and master and transactional data are migrated from the legacy system, thus standard data migration tools and content has to be used. 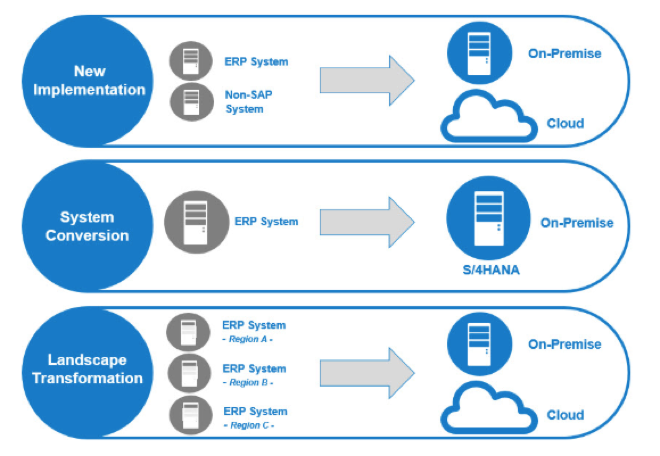 System Conversion — This is a complete conversion of an existing SAP Business Suite system to SAP S/4 HANA, typically using the software update manager (SUM) and database migration option (DMO). Landscape Transformation — This is a consolidation of current regional SAP systems into one global SAP S/4 HANA system or a split out of different parts of a system: customers who want to consolidate their landscape or carve out selected entities (such as a company code) or processes into a single SAP S/4 HANA system. Preparing an SAP ECC system for migration to SAP S/4 HANA means focusing on the relevant data to move ahead to a new environment while eliminating the need to migrate less important or non-relevant data. In addition to reducing the volume of data to speed critical migration tasks, proper S/4 HANA data preparation allows companies to minimize the use of expensive “in-memory” resources and computing hardware. Encross SAP S/4 HANA Migration experts help companies select and plan for the migration scenario most appropriate for their business. This often starts with an initial migration planning assessment to profile and prepare existing SAP system/data for the processes involved in S4/HANA migration. Encross offers services and solutions for Data Archiving, SAP Document and Imaging Solutions, SAP BI/BW Archiving, SAP Data Retention Tool for Tax reporting (DaRT), and Enterprise Data Retention using leading industry tools like, SAP ILM (Information Lifecycle Management), OpenText®, PBS®, TJC® and other leading archive add-on solutions. We are recognized experts in SAP ILM services. Encross consultants and project leaders have implemented Archiving solutions for leading companies in the medical device industry, top consumer goods manufacturers, Fortune 100 Pharmaceutical companies and many others. Contact your Encross Representative to schedule an SAP archiving opportunity assessment for your company. Link Documents, Images and Content to SAP business processes. Enhance SAP Business Processes To Reduce Cycle Times, Speed Information Access, and Lower Costs. Linking documents, images and other content to SAP transactions and workflows help organizations reduce business process costs, while improving customer communications and service. Companies can receive an exceptionally fast ROI by automatically integrating and presenting documents in dynamically adjustable formats via various delivery channels to customers, partners, suppliers, and employees. Encross Consulting helps companies integrate documents, images and other content into their SAP Processes using prepackaged solutions or with easily-configured custom solutions built using standard SAP and OpenText capabilities. SAP Extended ECM enables fully digitized access to everything in your enterprese by connnecting e-mails, documents, and other content to core SAP business processes. SAP Document Presentment by OpenText® –Create and present documents linked to SAP transactions across a variety of business processes for customers, partners, suppliers and employees. SAP Invoice Management by OpenText® – Reduce costs and streamline accounts payable operations by creating , routing, monitoring and problem resolution of Vendor Invoices and Purchase Orders. SAP Employee File Management by OpenText® – Link HR related documents and content, either print or electronic, in a single compliant, integrated and accessible digital record. By using the capabilities of integrated documents, images, and other related content with your SAP business processes, SAP Extended Enterprise Content Management by OpenText® will speed critical business processes, reduce cost and improve key company performance metrics. Call an Encross Representative to learn how we can help your organization with a business process review to define potential savings available to your company. Many Companies implement Enterprise Applications like SAP to consolidate redundant systems or to retire systems that are the result of prior mergers and acquisitions. But often, capturing the cost savings that were detailed in the original business case can be elusive because of compliance and regulatory requirements the need to retain historical ERP system information. Keeping legacy systems operational just to maintain historical information is expensive – OEM software support fees can be expensive to maintain, systems take up valuable space, and specialized support expertise is usually required. Moreover, the company runs the risk that the system won’t be supported as long as you are required to retain the data – upgrading “sunset” systems in order to insure access to historical data is not a business case most managers want to take to their boards. But business and legal compliance requirements make it necessary to ensure efficient access to this information for audit and fiduciary purposes. Legacy System retirement should be managed in the context of an enterprise information lifecycle management (ILM) strategy. There are a variety of methods that can be used to retire legacy systems– Encross has developed methodologies in which application data (i.e. transactional records, documents and images) can be extracted from the legacy application and stored in a neutral format to enable low cost long term retention of data. Based on retention and compliance requirements, data can be accessed, browsed, and reported on using a variety of tools. Our Archiving and System Decommissioning consultants facilitate this process with in-depth knowledge of the procedures and techniques available to cost effectively meet corporate policy, industry and government regulations as well as legal retention & accessibility requirements. Contact an Encross Representative for an initial assessment of your legacy system retirement cost saving opportunities. SAP Analytics & Business Intelligence Solutions can empower your teams to achieve remarkable results by allowing anyone in your organization self-service access to relevant information. It can also help business users transform their decision making by providing fact-based, quality information regardless of where the data resides. Planning and Financial Consolidation – Increase the effectiveness of planning budgeting and financial reporting processes. Profit and Cost Management – Identify the causes of under-performance take action to improve. Supply Chain Performance Management – Improve Supply chain effectiveness with visability into operational process metrics. Sales and Operations Planning – Synchronize demand and supply plans aligned to your company’s financial goals. Environmental, Health and Safety Management – integrate the management of operational risks related to EH&S. Sustainability Performance Management – Set goals and communicate performance.